Today 90 years ago, on the 15 of November 1923, by fixing the value of the recently created Rentenmark at a rate of 1 trillion (1.000.000.000.000) Papermark per 1 Rentenmark, and one month later, by setting the rate of the Rentenrmark against the US Dollar at a rate of 4,2 Rentenmark per 1 US Dollar, the exchange rate that had prevailed between the Reichsmark and the US dollar before World War I, Hjalmar Schacht, the then new president of the Reichsbank, ended the German Hyperinflation of 1922-1923, a monetary phenomenon that it is often argued paved the way for the later onset of Nazism. Thorsten Polliet of The Ludwig von Mises Institute has written this article about it. On 15 November 1923 decisive steps were taken to end the nightmare of hyperinflation in the Weimar Republic: The Reichsbank, the German central bank, stopped monetizing government debt, and a new means of exchange, the Rentenmark, was issued next to the Papermark (in German: Papiermark). These measures succeeded in halting hyperinflation, but the purchasing power of the Papermark was completely ruined. To understand how and why this could happen, one has to take a look at the time shortly before the outbreak of World War I. Since 1871, the mark had been the official money in the Deutsches Reich. With the outbreak of World War I, the gold redeemability of the Reichsmark was suspended on 4 August 1914. The gold-backed Reichsmark (or “Goldmark,” as it was referred to from 1914) became the unbacked Papermark. Initially, the Reich financed its war outlays in large part through issuing debt. Total public debt rose from 5.2bn Papermark in 1914 to 105.3bn in 1918. 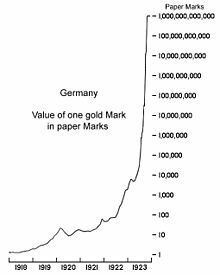 In 1914, the quantity of Papermark was 5.9 billion, in 1918 it stood at 32.9 billion. From August 1914 to November 1918, wholesale prices in the Reich had risen 115 percent, and the purchasing power of the Papermark had fallen by more than half. In the same period, the exchange rate of the Papermark depreciated 84 percent against the US dollar. The new Weimar Republic faced tremendous economic and political challenges. In 1920, industrial production was 61 percent of the level seen in 1913, and in 1923 it had fallen further to 54 percent. The land losses following the Versailles Treaty had weakened the Reich’s productive capacity substantially: the Reich lost around 13 percent of its former land mass, and around 10 percent of the German population was now living outside its borders. In addition, Germany had to make reparation payments. Most important, however, the new and fledgling democratic governments wanted to cater as best as possible to the wishes of their voters. As tax revenues were insufficient to finance these outlays, the Reichsbank started running the printing press. From April 1920 to March 1921, the ratio of tax revenues to spending amounted to just 37 percent. Thereafter, the situation improved somewhat and in June 1922, taxes relative to total spending even reached 75 percent. Then things turned ugly. Toward the end of 1922, Germany was accused of having failed to deliver its reparation payments on time. To back their claim, French and Belgian troops invaded and occupied the Ruhrgebiet, the Reich’s industrial heartland, at the beginning of January 1923. The German government under chancellor Wilhelm Kuno called upon Ruhrgebiet workers to resist any orders from the invaders, promising the Reich would keep paying their wages. The Reichsbank began printing up new money by monetizing debt to keep the government liquid for making up tax-shortfalls and paying wages, social transfers, and subsidies. From May 1923 on, the quantity of Papermark started spinning out of control. It rose from 8.610 billion in May to 17.340 billion in April, and further to 669.703 billion in August, reaching 400 quintillion (that is 400 x 1018) in November 1923. Wholesale prices skyrocketed to astronomical levels, by rising by 1.813 percent from the end of 1919 to November 1923. At the end of World War I in 1918 you could have bought 500 billion eggs for the same money you would have to spend five years later for just one egg. Through November 1923, the price of the US dollar in terms of Papermark had risen by 8.912 percent. The Papermark had actually sunken to scrap value. With the collapse of the currency, unemployment was on the rise. Since the end of the war, unemployment had remained fairly low — given that the Weimar governments had kept the economy going by vigorous deficit spending and money printing. At the end of 1919, the unemployment rate stood at 2.9 percent, in 1920 at 4.1 percent, 1921 at 1.6 percent and 1922 at 2.8 percent. With the dying of the Papermark, though, the unemployment rate reached 19.1 percent in October, 23.4 percent in November, and 28.2 percent in December. Hyperinflation had impoverished the great majority of the German population, especially the middle class. People suffered from food shortages and cold. Political extremism was on the rise. The central problem for sorting out the monetary mess was the Reichsbank itself. The term of its president, Rudolf E. A. Havenstein, was for life, and he was literally unstoppable: under Havenstein, the Reichsbank kept issuing ever greater amounts of Papiermark for keeping the Reich financially afloat. Then, on 15 November 1923, the Reichsbank was made to stop monetizing government debt and issuing new money. At the same time, it was decided to make one trillion Papermark (a number with twelve zeros: 1,000,000,000,000) equal to one Rentenmark. On 20 November 1923, Havenstein died, all of a sudden, through a heart attack. That same day, Hjalmar Schacht, who would become Reichsbank president in December, took action and stabilized the Papermark against the US dollar: the Reichsbank, and through foreign exchange market interventions, made 4.2 trillion Papermark equal to one US Dollar. And as one trillion Papermark was equal to one Rentenmark, the exchange rate was 4.2 Rentenmark for one US dollar. This was exactly the exchange rate that had prevailed between the Reichsmark and the US dollar before World War I. The “miracle of the Rentenmark” marked the end of hyperinflation. How could such a monetary disaster happen in a civilized and advanced society, leading to the total destruction of the currency? Many explanations have been put forward. It has been argued that, for instance, that reparation payments, chronic balance of payment deficits, and even the depreciation of the Papermark in the foreign exchange markets had actually caused the demise of the German currency. However, these explanations are not convincing, as the German economist Hans F. Sennholz explains: “[E]very mark was printed by Germans and issued by a central bank that was governed by Germans under a government that was purely German. It was German political parties, such as the Socialists, the Catholic Centre Party, and the Democrats, forming various coalition governments that were solely responsible for the policies they conducted. Of course, admission of responsibility for any calamity cannot be expected from any political party.” Indeed, the German hyperinflation was manmade, it was the result of a deliberate political decision to increase the quantity of money de facto without any limit. What are the lessons to be learned from the German hyperinflation? The first lesson is that even a politically independent central bank does not provide a reliable protection against the destruction of (paper) money. The Reichsbank had been made politically independent as early as 1922; actually on behalf of the allied forces, as a service rendered in return for a temporary deferment of reparation payments. Still, the Reichsbank council decided for hyperinflating the currency. Seeing that the Reich had to increasingly rely on Reichsbank credit to stay afloat, the council of the Reichsbank decided to provide unlimited amounts of money in such an “existential political crisis.” Of course, the credit appetite of the Weimar politicians turned out to be unlimited. The second lesson is that fiat paper money won’t work. Hjalmar Schacht, in his 1953 biography, noted: “The introduction of the banknote of state paper money was only possible as the state or the central bank promised to redeem the paper money note at any one time in gold. Ensuring the possibility for redeeming in gold at any one time must be the endeavor of all issuers of paper money.” Schacht’s words harbor a central economic insight: Unbacked paper money is political money and as such it is a disruptive element in a system of free markets. The representatives of the Austrian School of economics pointed this out a long time ago. Paper money, produced “ex nihilo” and injected into the economy through bank credit, is not only chronically inflationary, it also causes malinvestment, “boom-and-bust” cycles, and brings about a situation of over-indebtedness. Once governments and banks in particular start faltering under their debt load and, as a result, the economy is in danger of contracting, the printing up of additional money appears all too easily to be a policy of choosing the lesser evil to escape the problems that have been caused by credit-produced paper money in the first place. Looking at the world today — in which many economies have been using credit-produced paper monies for decades and where debt loads are overwhelmingly high, the current challenges are in a sense quite similar to those prevailing in the Weimar Republic more than 90 years ago. Now as then, a reform of the monetary order is badly needed; and the sooner the challenge of monetary reform is taken on, the smaller will be the costs of adjustment. Bank of Japan unveils aggressive easing @ Financial Times “The BoJ said it would double Japan’s monetary base from Y135tn ($1.43tn) to Y270tn by March 2015, mainly by buying more long-term government bonds.”. “We can’t escape deflation with the incremental approach that’s been taken until now,” Mr Kuroda said after the announcement. “We need to use every means available.”. As Mr. Evans-Pritchard mentions in his article, “There were two extreme episodes of money printing in the inter-war years. The Reichsbank’s financing of Weimar deficits from 1922 to 1924 – like lesser variants in France, Belgium and Poland – is well known. The result was hyperinflation. Clever people made hay. The slow-witted – or the patriotic – lost their savings.”. The policies and situations described in the articles above suggest that it might happen, again.